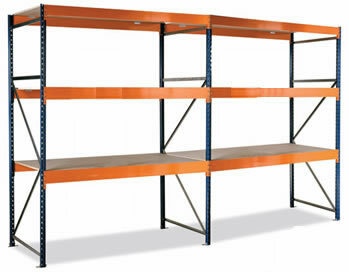 Budget Longspan and Heavy Duty Shelving at fantastic prices. Discounts available from Swindon Office. A fully adjustable quality longspan heavy duty shelving at an affordable price. Available in four different shelf depths:- 400mm, 600mm, 800mm and 900mm. Four shelf levels are normally supplied but you may add or deduct shelves as required. RH Systems budget longspan shelving is ideal for office and industrial storage. We supply and install Longspan Shelving in Swindon, We supply and install Longspan Shelving in Newbury, We supply and install Longspan Shelving in Reading, We supply and install Longspan Shelving in Chippenham, We supply and install Longspan Shelving in Bath, We supply and install Longspan Shelving in Bristol, We supply and install Longspan Shelving in Trowbridge, We supply and install Longspan Shelving in Oxford and We supply and install Longspan Shelving in Gloucester. A fully adjustable quality longspan heavy duty shelving at an affordable price with upto 1215kg Uniformly Distributed Load (UDL) per shelf. Four shelf depths are available suitable to accomodate even the smallest space 400, 600, 800 and 900mm together with six standard bay widths 950, 1150, 1350, 1500, 1850 and 2400mm. This durable, epoxy powder-coated finish longspan shelving provides for a quick and simple installation with uprights freestanding or fixed to floor. This Longspan shelving is typically shipped with four shelf levels. However we see flexibility as being crucial to customer satisfaction so will add or deduct the number of shelves to suit your individual requirements. Additional longspan shelfs may be purchased seperatley at any time to extend and adapt your storage needs now or in the future. Longspan shelving comes with stepped beams with flush fitting 18mm high density chipboard. The longspan shelving unit height is 2000mm as standard with taller units available 2500, 3000, 3500 and 4000mm. Other longspan shelving options are available including those supplied by other manufacturers. To order budget longspan shelving give us a call to discuss your requirements further.